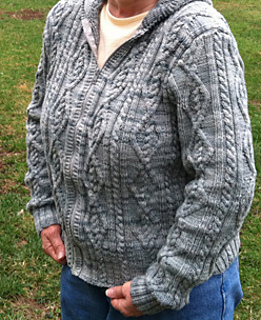 4/12/11: zipper is finally in! Used this fabulous tutorial found through knittinghelp.com. I love the fit! 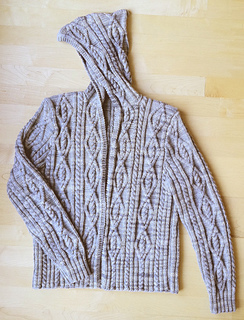 Seaming was a challenge for me because I haven’t done much of it. Not sure why, but found number of stitches on hold for shoulders were off in number – pattern matched, but too many stitches bound off on back panel. Ripped back and reworked shoulder shaping on the back so back shoulder stitches matched front panel shoulder stitches. Pattern lined up perfectly for shoulder seams. Pattern begins with a right-side row. 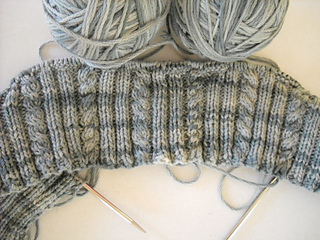 Wasn’t happy w/the knitted cast on so frogged and started again with a long-tail cast on. Began with an extra wrong-side row so the 1st row would begin on the right side of the CO. Working with 2 skeins AAT; alternating skeins every 2 rows. Like the way the color is working up.